Happy Holidays from CC Sunscreens! 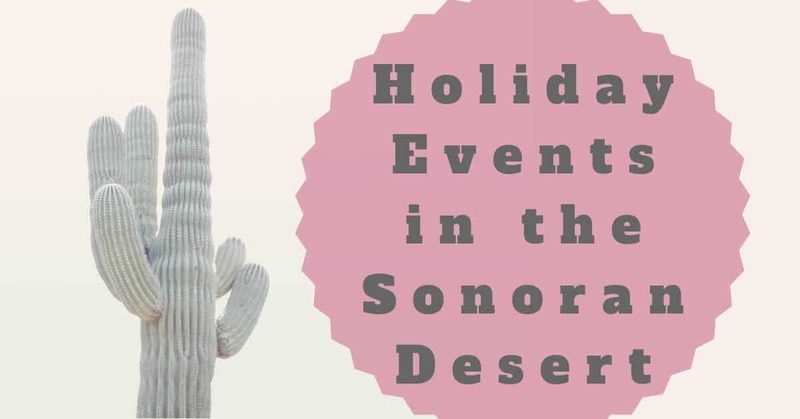 If you’re spending the holidays in Central Arizona, you know we have a unique way of bringing in the seasonal cheer. Our Southwestern winter features epic lighting displays, plenty of good music and even a little bit of snow. As you get ready to celebrate with your loved ones, here’s some great events to check out in the city and the region. This holiday parade truly features some remarkable “floats”. This extravagantly lit boat parade brings the holiday spirit to Tempe with beautiful light creations gliding across the city’s lake. The parade is accompanied by a holiday festival on the shore with food and drink, visits with Santa, a holiday bazaar and plenty more activities for the whole family. While the children of Phoenix may not get the chance to experience a school closure “snow day”, they can still get in a snow day or two during their holiday break. The last week of the year the Arizona Science Center blows in 100 tons of real snow, completely transforming their Heritage and Science Park. Kids can partake in all flavors of wintery fun, sledding, building snowmen, creating snow angels and snow sculptures. The week concludes with a Harry Potter-themed magical New Year’s celebration and theme events all week long. The Desert Botanical Garden’s seasonal light display gets extra amplitude this year with sound and light installations from the Klip Collective’s Electric Desert. For 29 nights in December, the Botanical Garden creates a magical spectacle of glowing holiday wonder with over eight thousand hand lit luminaria bags and a spectacular holiday light display. The Electric Desert combines three-dimensional mapped video projections with stunning soundscapes for an entirely new experience of desert flora. Drawing on traditional lantern festivals for inspiration, Lights of the World puts together a truly outstanding holiday experience. With 75 large-scale displays of internationally themed lanterns, spanning from 18 to 60 feet, and free carnival rides and live entertainment with admission, Lights of the World is a jaw dropping holiday display. More than ten million lights go into creating the glittering wonderland, where wonders of the world are represented in bold color and pattern. A visual feast and a great holiday tradition. It’s Phoestivus for the rest of us! The Phoestivus Market takes over the Phoenix Public Market for two Thursday evenings this month. Check off your holiday shopping with local, artisanal and handcrafted gifts from the region. Phoestivus features over 150 local vendors selling foodstuffs, crafts, pottery, art and more. This year the Phoestivus Market comes ready with its own beer, Phoestivus Ale, brewed by the Phoenix Ale Brewery. Diehard Seinfeld fans will have the added treat of gathering round the Phoestivus Pole and participating in Pheats of Strength and, of course, an Airing of Grievances. Phoenix may have an arid desert climate but that doesn’t prevent us from fitting some cold weather pastimes into our schedule. The annual CitySkate Holiday Ice Rink is already up and running – expect it to stick around until early January. CitySkate is located in the middle of vibrant downtown Phoenix and features a fun range of holiday events. Of course, Santa has a schedule of appearances to make and everyone will appreciate relaxing with a cup of hot cocoa after hitting the ice. Events at CitySkate happen all season long under the glow of a beautiful decorated tree and art installations from the Phoenix Art Museum. December 14th checkout a saucy holiday movie double feature with outdoor screenings of Home Alone and National Lampoon’s Christmas Vacation. From all of us at CC Sunscreens, we wish you and your loved ones a happy holiday season!